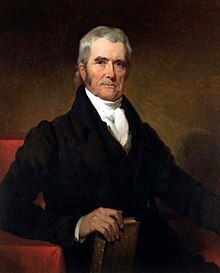 Untuk orang lain dengan nama yang sama, lihat John Marshall (disambiguasi). John James Marshall (24 September 1755 – 6 Juli 1835) adalah Ketua Keadilan Amerika Serikat keempat (1801–1835). Sebelumnya, Marshall menjadi pemimpin Partai Federal di Virginia dan menjabat dalam Dewan Perwakilan Amerika Serikat dari 1799 sampai 1800. Ia adalah Sekretaris Negara di bawah Presiden John Adams dari 1800 sampai 1801. Abraham, Henry J. (1992). Justices and Presidents: A Political History of Appointments to the Supreme Court (edisi ke-3rd). New York: Oxford University Press. ISBN 0-19-506557-3. Baker, Leonard, (1974) John Marshall: A Life in Law (New York: Macmillan). KF8745 M3 B3. Beveridge, Albert J. The Life of John Marshall, in 4 volumes (Boston: Houghton Mifflin Co., 1919), winner of the Pulitzer Prize, Volume I, Volume II, Volume III and Volume IV at Internet Archive. Frank, John P. (1995). Friedman, Leon; Israel, Fred L., ed. The Justices of the United States Supreme Court: Their Lives and Major Opinions. Chelsea House Publishers. Johnson, Herbert Alan, "John Marshall" in Leon Friedman and Fred L. Israel, eds. The Justices of the United States Supreme Court: Their Lives and Major Opinions — Vol. 1 (1997) pp 180–200. ISBN 0-313-27932-2. Johnson, Herbert A. The Chief Justiceship of John Marshall from 1801 to 1835. University of South Carolina Press, 1998. 352 pp. ISBN 1-57003-121-5; ISBN 978-1-57003-121-2. Newmyer, R. Kent, (1968) The Supreme Court under Marshall and Taney, University of Connecticut. Rudko, Frances H., (1991) John Marshall, Statesman, and Chief Justice (Westport, Conn.: Greenwood Press). ISBN 0-313-27932-2. Shevory, Thomas C.; John Marshall's Law: Interpretation, Ideology, and Interest Greenwood Press, 1994. ISBN 0-313-27932-2. ^ "Federal Judicial Center: John Marshall". 2009-12-12. Diakses tanggal 2009-12-12. ^ "Marshall Genealogy". Diakses tanggal 29 March 2014. ^ "Online review, John Marshall and the Heroic Age of the Supreme Court". Smith, Jean Edward (March 15, 1998) . John Marshall: Definer Of A Nation (edisi ke-Reprint). New York, NY: Owl Books. ISBN 0-8050-5510-X. Bennett, Georgia (February 10, 1935). "John and Tom -- Rivals in Everything". Richmond Times-Dispatch. Booknotes interview with Newmyer on John Marshall and the Heroic Age of the Supreme Court, February 24, 2002. Halaman ini terakhir diubah pada 22 Maret 2017, pukul 13.27.